emma lamb: Peter Potter picked a pek of pretty pot holders! Peter Potter picked a pek of pretty pot holders! I'm really pleased that they have been given such a prominent position, they're hung in the main hall (or front room - the gallery isn't that big!) and they are one of the first things to grab your attention. I got a wee rush of excitement when I first saw them, and another when I found out that at least one has already gone to a new home! Apparently they are more of a talking point that anything else, hopefully that's a good thing!? Anyway, the exhibition runs until the end of January so you never know a few more might find their forever homes yet! Oh, and this had us completely baffled! That is until we consulted the font of all nature knowledge, aka my father-in-law, who tells us that it is apparently known as a 'witch's broom'! A huge mass of twigs growing from a single point usually caused by a disease. I was completely fascinated with it and wanted to get up close for a few pretty macro shots, but the lack of a ten foot ladder meant that I had to make do with this pic instead! Oh, and how could I not include a pic of the wee man looking especially cute!? Your display in the gallery looks especially amazing! I'm sure a few more will find new homes, how can anyone resist? Your photos of the foggy day are wonderful. I love the one with the moss. Have a truely lovely day. But that witches broom is so strange! I've never heard of those before, it's a little freaky looking! Such wonderful pictures! Oh how I wish my community had such beautifully historical places to gaze at.... And old churches are so beautiful! A witches broom?! Wow, that is amazing! I have never seen anything like that before. I am also loving your title, your potholders and your gorgeous photos. Oh wow this was a lovely suprise for me to read! I have only just discovered your work and your blog very recently and as soon as I saw the title I was intrigued! I grew up in Haddington, my family still live there and for 2 years whilst at uni I worked in the coffee shop in Peter Potters! 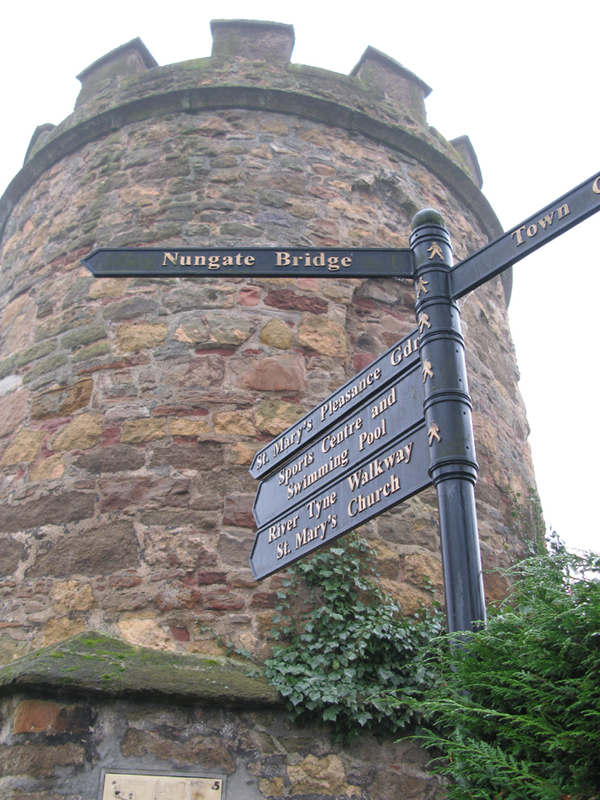 I am in Nottingham now and miss Haddington very much so it was lovely to see the photos and have a reminder of my home town. Congratulations on your display in the exhibition - it really is a lovely gallery with a wonderful selection of work and the best coffee and cake in town! My sister in law just showed me your blog- i love your pot holders! hoping to do something similar on my walls but I am still new to crochet and a bit crap. Nice post- refreshingly un- christmassy in a nice way! its quite eerie with the fog and the castle and the witches broom! i feel sad for the tree, though! how very atmospheric! 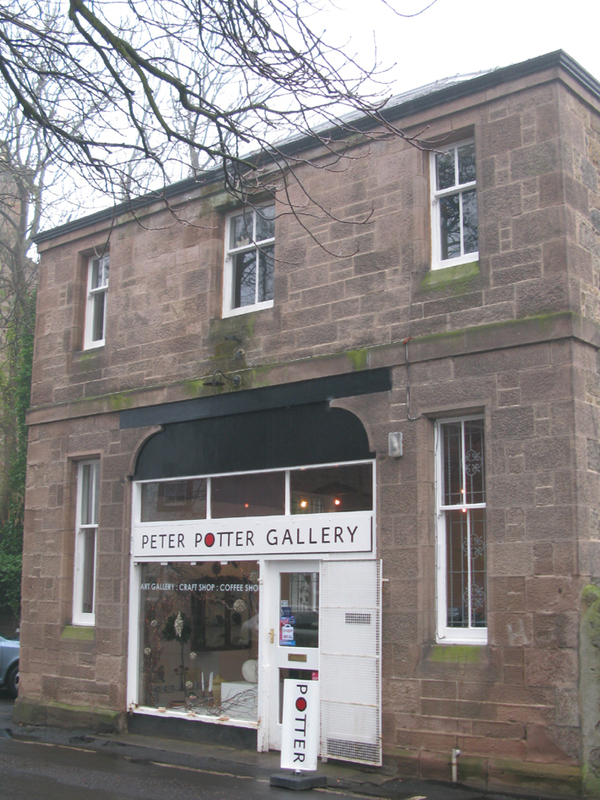 your pot holders look lovely in the peter potter gallery, congratulations, and I think your title is very clever too. Congrats my friend! They look so great!!! And yes, that title is completely genius :) And what a pretty place too! Gorgeous pics! I love the potholders...they look so pretty just like that! wow the Gallery looks great, and ins't it nice after all this grey rain to have this lovely winter light and snow too makes picture so easy to find again!